It was a place you may have visited on a hot summer night. Or the spot where your grandparents danced as teenagers. But now the old ballroom at Idora Park is gone for good. The intensity of the inferno sent up a column of black you could easily see from Hubbard. There was no way Youngstown firefighters were going to risk going in to save a building they knew was empty. All the utilities were shut off years ago. That leaves only the possibility that someone deliberately set the blaze. Vagrants and kids had been breaking in constantly. Couple that with the fact that the nearest fire hydrant was over a thousand feet away and the fire department had been planning for trouble. "We have been down in here because we know we have water problems in the area. So we checked it out to see what we would do in case of a fire" says Youngstown Fire Chief John O'Neill. Jason Whitehead is the administrative manager for Mt. Calvary Pentecostal Church, which owns the old Idora Park property. The church has plans to build a school, nursing facility and retreat house here. Church members, preservationists and the fire department have been debating what to do about the ballroom for the past three years. "We had not determined whether or not we were going to bring the building down or whether we were going to use it." Of course, all that's left now is rubble to clear. Richard Conrad, a neighbor of the dilapidated park said a tragedy like this was bound to happen. "You knew it was going to happen sooner or later. They should have done something to put it all back together a long time ago." A dangerous and expensive mess is all that's left of the Idora Park Ballroom. It was destroyed by fire Monday. Youngstown Arson investigators say the cause of the fire will remain undetermined. That's because of the extensive damage. In the meantime, the structure is considered dangerous because it was filled with asbestos. Before the fire, it was estimated the owners would have to spend 125-thousand dollars to remove the contamination. That price is bound to rise now. The owner of the old amusement park, Mount Calvary Pentecostal Church, will have to bear the cost of the cleanup. Total damage to the ballroom is said to be half a million dollars. 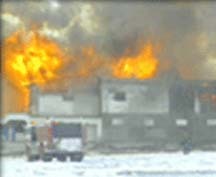 AS WE TOLD YOU AT THE TOP OF OUR NEWSCAST, THE HISTORIC BALLROOM AT THE LONG-VACANT IDORA PARK, WENT-UP IN FLAMES TODAY. JOE BELL IS THERE RIGHT NOW, TO TELL US ABOUT IT. AS YOU CAN SEE, THE RUBBLE OF THAT HISTORIC STRUCTURE IS STILL SMOLDERING. EIGHT HOURS AGO, THIS PLACE WAS AN INFERNO.SENDING UP A COLUMN OF BLACK SMOKE YOU COULD SEE TEN MILES AWAY. THE 90-YEAR-OLD TIMBERS WERE PRIME FUEL. SINCE THE BUILDING HAS BEEN EMPTY FOR YEARS, YOUNGSTOWN FIREFIGHTERS DID NOT TRY TO ENTER THE STRUCTURE AND SAVE IT. EVEN THOUGH ELECTRICITY AND GAS SERVICE HAVE BEEN CUT OFF, THIS WAS FIRE THEY'D BEEN FEARING FOR A LONG TIME. KNOWING THAT VAGRANTS WERE LIVING IN THERE AND THERE HAVE BEEN KIDS IN THERE BFORE, WE HAVE BEEN DOWN IN HERE BECAUSE WE KNOW WE HAVE WATER PROBLEMS IN THE AREA. SO WE CHECKED IT OUT TO SEE WHAT WE WOULD DO IN CASE OF A FIRE. ARSON INVESTIGATORS ARE OPERATING ON THE ASSUMPTION THIS WAS A DELIBERATE JOB. THEY ARE NOT YET SAYING ANYTHING ABOUT THE METHOD USED TO DO IT. THANKS-- JOE BELL LIVE IN YOUNGSTOWN. ASK ANYONE WHO HAS LIVED IN THE VALLEY 20 YEARS OR MORE -- AND THEY'RE SURE TO REMEMBER AT LEAST ONE GOOD TIME AT THE IDORA BALLROOM. TRICIA PERRY TAKES A LOOK AT THE HISTORY OF ONE OF THE AMUSEMENT PARK'S OLDEST BUILDINGS. A DRAWING CARD FOR THE AMUSEMENT PARK SINCE 1910 -- BURNED TO THE FOUNDATIONS. IT DOESN'T LOOK LIKE THE BALLROOM ANYMORE. THE BLAZE BROUGHT OUT THOSE WHO HAD SEEN HAPPIER DAYS HERE -- WHEN BIG BANDS DREW BIGGER CROWDS THAT DANCED THE NIGHT AWAY. SHALE-- WHO WROTE A BOOK ABOUT IDORA-- SAYS THE BALLROOM WITH IT'S 22-THOUSAND SQUARE FOOT DANCE FLOOR WAS A SYMBOL OF THE PARK'S GOLDEN YEARS IN THE 30'S-- AN ORNATE SHOWPIECE AT THE END OF A TROLLEY STOP. AFTER A COASTER FIRE CLOSED THE PARK IN 1984 -- THE BALLROOM CONTINUED TO HOUSE LARGE EVENTS FOR AWHILE -- BUT SINCE THE LATE 80'S IT HAS STOOD NEGLECTED. SOME EXPECTED THIS ENDING. TRICIA PERRY 27 FIRST NEWS. YOUNGER IDORA FANS MAY REMEMBER THE CAR SHOW, THE HOME AND GARDEN SHOW, AND THE MANY MUSICAL ACTS THAT PLAYED AT THE BALLROOM IN THE 70'S AND 80'S. GOOD EVENING -- I'M SARAH EISLER. AND, I'M TOM HOLDEN. IT WAS A PLACE YOU MAY HAVE VISITED ON A HOT SUMMER NIGHT. OR THE SPOT WHERE YOUR GRANDPARENTS DANCED AS TEENAGERS. BUT TONIGHT, THE OLD BALLROOM AT IDORA PARK IS GONE FOR GOOD. JOE BELL IS ON THE OLD PARK GROUNDS. JOE, IS THE BALLROOM STILL BURNING? THE INTENSITY OF THIS INFERNO SENT UP A COLUMN OF BLACK YOU COULD EASILY SEE FROM HUBBARD. THERE WAS NO WAY YOUNGSTOWN FIREFIGHTERS WERE GOING TO RISK GOING IN TO SAVE A BUILDING THEY KNEW WAS EMPTY. ALL THE UTILITIES WERE SHUT OFF YEARS AGO. THAT LEAVES ONLY THE POSSIBILITY THAT SOMEONE DELIBERATELY SET THE BLAZE. VAGRANTS AND KIDS HAD BEEN BREAKING IN CONSTANTLY. COUPLE THAT WITH THE FACT THAT THE NEAREST FIRE HYDRANT WAS OVER A THOUSAND FEET AWAY.AND THE FIRE DEPARTMENT HAD BEEN PLANNING FOR TROUBLE. WE HAVE BEEN DOWN IN HERE BECAUSE WE KNOW WE HAVE WATER PROBLEMS IN THE AREA. SO WE CHECKED IT OUT TO SEE WHAT WE WOULD DO IN CASE OF A FIRE. WE DON'T HAVE ANY IDEA OF ANY PARTICULAR PERSON. WE SECURE THE PARK. THEY FIND A WAY BACK IN. JASON WHITEHEAD'S THE ADMINISTRATIVE MANAGER FOR MT. CALVARY PENTECOSTAL CHURCH, WHICH OWNS THE OLD IDORA PARK PROPERTY. THE CHURCH HAS PLANS TO BUILD A SCHOOL, NURSING FACILITY AND RETREAT HOUSE HERE. CHURCH MEMBERS, PRESERVATIONISTS AND THE FIRE DEPARTMENT HAVE BEEN DEBATING WHAT TO DO ABOUT THE BALLROOM FOR THE PAST THREE YEARS. WE HAD NOT DETERMINED WHETHER OR NOT WE WERE GOING TO BRING THE BUILDING DOWN OR WHETHER WE WERE GOING TO USE IT. OF COURSE, ALL THAT'S LEFT NOW IS RUBBLE TO CLEAR. YOU KNEW IT WAS GOING TO HAPPEN SOONER OR LATER. TEY SHOULD HAVE DONE SOMETHING TO PUT IT ALL BACK TOGETHER A LONG TIME AGO. JOE -- WE UNDERSTAND THAT THERE WAS TALK OF ASBESTOS CONTAMINATING THE BUILDING. IS THAT POSING ANY RISK TO PEOPLE OUT THERE NOW? THANKS, JOE. TODAY'S FIRE IS THE SAD END TO WHAT MANY VALLEY RESIDENTS REMEMBER AS AN EXCITING AND LIVELY AMUSEMENT PARK. THE PARK OPENED IN MAY OF 1899. IT HAD MANY SUCCESSFUL YEARS UNTIL A FIRE IN 1984 INVOLVING THE WILDCAT COASTER AND THE LOST RIVER SQUASHED HOPES OF A FUTURE. THE PARK CLOSED IN SEPTEMBER OF THAT YEAR. A FIRE IN 1986 FURTHER DAMAGED THE PARK. HISTORIANS SAY THE BALLROOM WAS A SYMBOL OF THE PARK'S BEST YEARS. IT'S A SAD DAY FOR THOSE WHO'VE TRIED TO RESURRECT IDORA OVER THE YEARS. AMONG THEM, VALLEY ARTIST BOB BARKO WHO JOINS US LIVE FROM THE PARK. BOB, WHAT ARE YOU THINKING AS YOU SEE THAT OLD BALLROOM DESTROYED BY FIRE? YOU'VE SPENT MANY HOURS DOCUMENTING PIECES OF THE PARK IN YOUR ARTWORK. WHAT'S YOUR FONDEST MEMORY OF THAT OLD BALLROOM? WHAT'S YOUR NEXT STEP--AS FAR AS ANY EFFORT TO SAVE THE PARK? BOB BARKO -- THANK YOU FOR JOINING US TONITE. TO FIND OUT MORE ABOUT IDORA PARK CLICK ON WKBN-DOT-COM. AT THIS HOUR, THE RUBBLE OF THE HISTORIC IDORA PARK BALLROOM IS STILL SMOLDERING. SHORTLY BEFORE TEN O'CLOCK THIS MORNING, FLAMES BROKE OUT IN THE BASEMENT, AND QUICKLY SENT UP A COLUMN OF BLACK SMOKE. THE 90-YEAR-OLD TIMBERS WERE PRIME FUEL. SINCE THE BUILDING HAS BEEN EMPTY FOR YEARS, YOUNGSTOWN FIREFIGHTERS DID NOT TRY TO ENTER THE STRUCTURE AND SAVE IT. ELECTRICITY AND GAS SERVICE HAVE BEEN CUT OFF FOR YEARS. ARSON INVESTIGATORS ARE OPERATING ON THE ASSUMPTION THAT SOMEONE INTENTIONALLY SET THE BLAZE. IT WAS INEVITABLE. WE KNOW WITH VAGRANTS COMING IN AND OUT OF THE BUILDING, WE'VE HAD TROUBLE WITH THAT IN THE PAST, KNOWING THAT VAGRANTS WERE LIVING IN THERE. AND THERE HAVE BEEN KIDS IN THERE BEFORE. CLEANUP AFTER THE FIRE POSES ANOTHER PROBLEM. THE BUILDING WAS CONTAMINATED WITH ASBESTOS, AND WORKERS WILL HAVE TO TREAT THE RUBBLE AS HAZARDOUS MATERIAL. TODAY'S FIRE IS THE SAD END TO WHAT MANY VALLEY RESIDENTS REMEMBER AS AN EXCITING AND LIVELY AMUSEMENT PARK. THE PARK OPENED IN MAY OF 1899. IT HAD MANY SUCCESSFUL FOR YEARS UNTIL A FIRE IN 1984 INVOLVING THE WILDCAT COASTER AND THE LOST RIVER SQUASHED HOPES OF A FUTURE. THE PARK CLOSED IN SEPTEMBER OF THAT YEAR. ANOTHER FIRE IN 1986 FURTHER DAMAGED THE PARK. HISTORIANS SAY THE BALLROOM WAS A SYMBOL OF THE PARK'S BEST YEARS. TODAY'S FIRE IS PARTICULARLY TOUGH TO TAKE FOR THOSE WHO HAVE WORKED OVER THE YEAR'S TO RESURRECT THE PARK. VALLEY ARTIST, BOB BARKO IS AMONG THEM -- HE SAYS NOW IT'S EVEN MORE IMPORTANT TO ACCELERATE THE PROCESS OF SAVING WHAT'S LEFT OF THE PARK. " THERE HAVE BEEN THREE FIRES. OLDEST COASTER IN AMERICA." YOUNGSTOWN CITY COUNCILMAN MICHAEL RAPOVY IS ALSO HOPING THAT TODAY'S FIRE WILL PROVIDE THE MOTIVATION NEEDED, TO COMPLETE THE DEMOLITION ON THE EXISTING ROLLER COASTER. MR. RAPOVY JOINS US NOW LIVE FROM THE NEWSROOM, WITH MORE ABOUT THIS. HELLO, AND THANK'S FOR BEING HERE. FIRST OF ALL: - YOUR THOUGHTS ON TODAY'S FIRE -- WERE YOU SURPRISED OR DID YOU THINK SOMETHING LIKE THIS WOULD HAPPEN? WHAT DO YOU THINK THE NEXT STEP SHOULD BE? ULTIMATELY -- WHAT WOULD LIKE TO SEE HAPPEN WITH THE REMNANTS OF THE PARK? THANK YOU AGAIN COUNCILMAN RAPOVY! STILL NO OFFICIAL CAUSE OF THE FIRE YESTERDAY THAT DESTROYED THE HISTORIC IDORA PARK BALLROOM. THE FLAMES BROKE-OUT IN THE BASEMENT, AND QUICKLY SENT-UP A COLUMN OF BLACK SMOKE THAT COULD BE SEEN 10 MILES AWAY. ARSON INVESTIGATORS ARE OPERATING ON THE ASSUMPTION THAT SOMEONE INTENTIONALLY SET THE BLAZE. GOOD EVENING. FIRST AT FIVE TONIGHT -- YESTERDAY, IT WAS A ROARING INFERNO. TODAY, AN EXPENSIVE, DANGEROUS MESS. THAT'S WHAT'S LEFT OF THE OLD IDORA PARK BALLROOM. THE HISTORIC BUILDING WENT UP IN FLAMES YESTERDAY. THE FIRE IS FINALLY OUT, BUT NOW COMES THE DIFFICULT TASK OF CLEANING UP. THE STRUCTURE WAS FILLED WITH ASBESTOS. THAT MEANS DEMOLITION CREWS HAVE TAKEN SPECIAL PRECAUTIONS TO SHIP THE DEBRIS TO A LANDFILL LICENSED TO ACCEPT THIS TYPE OF HAZARDOUS WASTE. PUBLIC HEALTH EXPERTS SAY THE SITE POSES NO DANGER TO THE NEIGHBORS AT LEAST FOR THE MOMENT. THE OWNER OF THE OLD AMUSEMENT PARK, MOUNT CALVARY PENTECOSTAL CHURCH, WILL HAVE TO BEAR THE COST OF THE CLEANUP. ARSON INVESTIGATORS ARE STILL TRYING TO FIND THE CAUSE OF YESTERDAY'S BLAZE. THEY NOW ESTIMATE THE TOTAL DAMAGE AT HALF-A-MILLION DOLLARS. A DANGEROUS AND EXPENSIVE MESS HAS BEEN LEFT OF THE IDORA PARK BALLROOM. IT WAS DESTROYED BY FIRE YESTERDAY. TODAY: YOUNGSTOWN ARSON INVESTIGATORS SAY THE CAUSE OF THE FIRE WILL REMAIN UNDETERMINED. THAT'S BECAUSE OF THE EXTENSIVE DAMAGE. IN THE MEANTIME: THE STRUCTURE IS NOW CONSIDERED DANGEROUS -- BECAUSE IT WAS FILLED WITH ASBESTOS. BEFORE THE FIRE, IT WAS ESTIMATED THE OWNERS WOULD HAVE TO SPEND 125-THOUSAND DOLLARS TO REMOVE THE CONTAMINATION. THAT PRICE IS BOUND TO RISE NOW. THE OWNER OF THE OLD AMUSEMENT PARK, MOUNT CALVARY PENTECOSTAL CHURCH, WILL HAVE TO BEAR THE COST OF THE CLEANUP. TOTAL DAMAGE TO THE BALLROOM IS SAID TO BE HALF-A-MILLION DOLLARS. THE ASBESTOS CLEAN-UP AT THE SITE OF THE IDORA BALLROOM FIRE, WILL BE THE RESPONSIBILITY OF THE CHURCH THAT OWNS THE PROPERTY. AIR POLLUTION CONTROL OFFICIALS IN YOUNGSTOWN, HAVE SENT CERTIFIED LETTERS TO MOUNT CALVARY "PENTECOSTAL CHURCH" DEMANDING THAT THE ASBESTOS BE REMOVED BY APRIL 1ST. AS LONG AS IT STAYS WET, IT'S NOT A DANGER. BUT WHEN THE SITE DRIES-OUT, HARMFUL FIBERS MAY BE RELEASED INTO THE AIR. THE ESTIMATED CLEAN-UP-COST, IS 300-THOUSAND DOLLARS. SO FAR, CHURCH OFFICIALS HAVE NOT RESPONDED. THE LOSS OF THE BALLROOM HAS PROMPTED A LOT OF REMINISCING THIS WEEK. WE DECIDED TO TAKE A LONGER LOOK, AT SOME OF THOSE VALLEY MEMORIES, SO TRICIA PERRY OPENED-UP THE MAHONING VALLEY HISTORY BOOK. SHE'S LIVE IN OUR NEWSROOM TO TELL US WHAT SHE FOUND. TRICIA? GINA -- IT'S HARD TO FIND SOMEONE WHO HAS LIVED HERE A LONG TIME WHO DOESN'T HAVE A MEMORY LINKED WITH THE GRAND BALLROOM AT IDORA. WE CAN'T PUT EVERY ONE ON TELEVISION, BUT HERE'S WHAT WE CAME UP WITH WHEN WE PUT VALLEY ARCHIVES AND LOCAL STORIES TOGETHER. FROM THE TIME IT WAS BUILT IN 1910 THE BALLROOM TOWERED OVER THE CROWDS AT IDORA -- IT WAS A PARK ACHOR -- A DESTINATION. FOR THE FIRST 4 DECADES, THE BALLROOM LOOKED LIKE A SHOWPLACE -- TOWERS PAINTED MANY COLORS WITH A VERANDA AND STRIPED AWNINGS. IT DREW PEOPLE IN. THE CEILING WAS DROPPED.NEW LIGHTING INSTALLED.AND THE CROWDS KEPT COMING. THE BALLROOM WAS THE SETTING FOR CONCERTS AND EVENTS.EVEN AFTER THE WILDCAT FIRE OF 1984 CLOSED THE REST OF THE PARK. PRESERVATIONS EFFORTS WERE TRIED.AND FAILED. BY THE TIME IDORA TURNED 100 IN 1999, THE BALLROOM, NOW OWNED BY A LOCAL CHURCH, WAS IN DECAY. 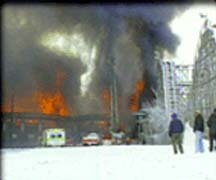 THE FIRE ON MARCH 5, 2001, WAS A TRAGIC END TO A BELOVED LANDMARK. WE FOUND OUT THAT AT ONE TIME, THERE WAS ROLLERSKATING IN THE BALLROOM, TOO. THANKS TO THE MAHONING VALLEY HISTORICAL SOCIETY, THE BUSINESS AND MEDIA ARCHIVES, AND ALL THOSE WHO REMEMBER IDORA PARK, FOR THEIR HELP AND THEIR STORIES. GINA? THANKS, TRICIA. SARAH?